A Money Mail probe has uncovered how thousands of expats have lost their homes and life savings at the hands of rogue financial advisers. Most victims are pensioners who were conned into gambling on high-risk investments. Ruth Lythe reports on how those hoping to find a life in the sun had their world torn apart. Thousands of British expats are on the brink of losing everything after being duped by unscrupulous financial advisers. The cowboys have persuaded thousands of our vulnerable pensioners — many in their 80s and 90s — to give up huge stakes of their property in exchange for investments that will never make a penny. The schemes are often sold by rogue financial advisers who exploit weak consumer laws on the Continent by falsely claiming to be bona fide accountants. Most of the victims are Britons who retired to Spain or France and wanted to use the cash in their homes to help with soaring living costs. John Parsons, founder of the Costa del Sol Action Group that is helping some of the victims in Spain, says: ‘The effect of all this worry is enormous. The stress has brought on a lot of serious health issues and they are extremely worried about their futures. The latest crisis follows a Money Mail investigation in 2008, which exposed how hundreds of British pensioners living on the Costa del Sol had gambled their homes in a risky equity-release scheme run by failed Icelandic bank Landsbanki. Now we can reveal how thousands more pensioners have fallen for other risky equity-release schemes on the Continent and are being hounded by banks demanding hundreds of thousands of pounds. During the property boom at the start of this century, around 100,000 pensioners left Britain to live out their days in southern France and Spain — attracted by a warmer climate and cheaper way of life. Many had a small pension, but hundreds of thousands of pounds from the sale of their UK home, which had soared in value over their lifetime. This money was used to supplement their incomes and buy a new home abroad. But soon after they moved, the cost of living in some areas soared as hundreds of thousands of Britons and Germans bought second homes. Many pensioners found they needed extra cash, and became easy prey for unregulated financial advisers who had left Britain to tap into the new wealth in these regions. Local rules meant they were able to act unchecked, selling investments from banks based anywhere in the world. Sometimes they claimed to be chartered accountants, but were not — many had never even registered with local authorities. In Spain in particular, these advisers could largely sell whatever they wanted — including types of investments and equity-release schemes outlawed in the UK. These paid handsome commissions that could net advisers a £50,000 payday. Banks offering equity-release loans included Icelandic bank Landsbanki, Scandinavian banks Nordea and Sydbank, and UK private bank Rothschild. However, Money Mail understands they are not the only banks involved. The majority of victims were told they could borrow the entire value of their property. The loan would incur interest, typically of up to 6.5 per cent. It meant that after ten years, a €500,000 (£412,667) loan would balloon to €681,240 (£562,251). To offset this, a large chunk — usually around 75 per cent of the loan — would be invested in a fund sold by the adviser. Pensioners were told returns would be so good that not only would they cover the interest on the equity release, but give the borrowers a little extra to spend. But the promises made turned out to be very different to the theory. This meant returns did not cover the cost of the interest repayments on the equity release. As the fund fell in value, it ate into the capital that borrowers needed to repay the debt. Charges for fund managers and commission also reduced the returns further. Worse was to follow when house prices in Spain fell. They had risen by 44 per cent between 2004 and 2008, when many of the victims had bought their homes. They have since plummeted by around 20 per cent. Those who had borrowed almost all of their property value were soon in negative equity — where the value of the property value was less than the money owed on it — leaving them unable to sell to clear their debt. In theory the borrowers were expected to pay off their loan at the end of four years. But because the value of the investments plunged so low, it triggered small print in the equity-release contract that allowed banks to demand repayment early. In the case of those expats with Landsbanki, the bank collapsed and the investment fund was snatched by company liquidators. Then a further problem struck — the value of the pound plunged against the euro. Many of the victims were paid pensions in pounds and relied on converting the money into euros every month. The drop meant the value of their pensions fell by a third. Campaigners estimate thousands of British pensioners have lost money through these schemes. 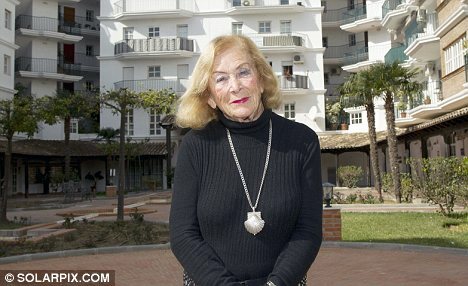 Former actress Julia Hilling, 88, fears her home will be swallowed up in repayments to her mortgage from Rothschild Bank. She was sold the mortgage in 2005 by a Malaga-based British financial adviser. Today, this company is classed as unauthorised by the Spanish authorities. Her property was valued at €300,000 (£249,966) and she took out a loan for €262,000 (£217,827). Around €17,000 (£14,138) was used for living expenses and she put €245,000 (£203,693) in an investment fund. 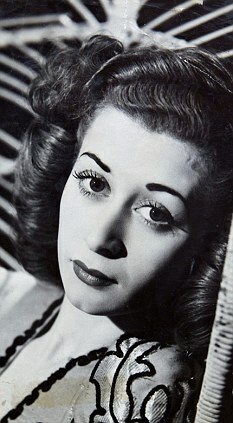 Mrs Hilling, who starred in musicals in the Forties and in revues with Sir Bruce Forsyth at the Windmill Theatre, London, had never invested or even had a mortgage before. Since 2005, the fund has plunged by around a third and will no longer cover her mortgage. She owes €330,000 (£274,362) and the debt continues to grow. Mrs Hilling says she is unable to cover these costs and fears the bank will take her property when she dies. ‘I needed the money desperately to pay everyday bills while I was out here, as I didn’t want to rely on my family,’ she says. Rothschild told Money Mail it would not repossess Mrs Hilling’s home. It stressed it had not sold the investment to her and was not demanding repayment nor had it paid commission. It urged her to contact the bank. Another victim is Eric Mould, 64, who after a career in sales moved to a seaside villa in Puerto Banus, near Malaga, in 2007. He and his wife Mary, 60, sold their four-bedroom detached house in the UK to buy a three-bedroom villa with a swimming pool for €1,188,000 (£990,000). But five years later they are living in a friend’s flat in the town and battling to pay €2,100 (£1,745) a month in mortgage repayments to Danish bank Nykredit. Shortly after arriving in Spain, the couple borrowed €1 million against their villa with the bank. They say the British financial adviser who sold them the equity-release mortgage told them it would be a ‘win-win’ situation. They were told they could free up hundreds of thousands of pounds from the mortgage, and the fund would pay off the loan. They believed the investment they were sold separately through Danish bank Sydbank would leave a little extra to boost their pensions. ‘This has totally devastated us. It is heart-breaking — we face losing the home we worked for a lifetime to buy,’ says Mr Mould. Sydbank would not comment on the case. Others who took out equity-release schemes with collapsed Icelandic bank Landsbanki have been told it will settle — as long as they pay part of the money owed, in some cases hundreds of thousands of pounds. One couple, Linda and Frances Barlow, aged 63 and 75, who live in Nice in the south of France, believe the bank’s liquidators will repossess their home by May unless they stump up €1.3 million (£1.08 million). The liquidators proposed a compromise deal, but it would have required the couple to find €500,000, which they do not have. The Barlows took only a small proportion of the loan as cash. The rest was invested by the bank, and lost when it collapsed in 2008. In February, the European Commission announced plans for an independent ombudsman to deal with mis-selling cases against financial advisers working in the Costa del Sol. Meanwhile, the Foreign and Commonwealth Office has issued official warnings about mortgage schemes advertised as a way of cutting tax bills. Any expats thinking of signing up to an equity-release scheme in Spain should check the company is registered with the agency in charge of the Spanish stock market, the Comision Nacional del Mercado de Valores (CNMV). It will also provide a list of companies that are not authorised to operate in Spain and those that have warnings issued against them. Remember to seek independent legal advice before signing a contract. If you believe you have been a victim of a fraud involving an equity-release scheme, then register a statement with the police. Seek independent legal advice about taking action through the courts. If you wish to complain about the performance of your investments, you should first complain to the equity-release company. After two months, if you are not happy with the response, take your complaint to the Spanish Investors’ Complaints Office: Oficina de Atención al Inversor, Miguel Ángel 11, 28010 Madrid. There is also an office at Paseo de Gràcia, 19, 4ª Planta, 08007 Barcelona. We have a lifetime loan with the Manchester Bldg.Soc. They told us which local lawyer we had to use (one we didn’t like) and we had to pay their fees and we paid their’s in Malaga. The said lawyer just read rapidly through the contract and asked whether we had any questions – we should have asked whether there were extra fees, eg. 5,000 euros for taking out a mortgage although ours isn’t one and if I had known this was yet another charge, we wouldn’t have signed. Obviously the house has dropped in value and when we sell we have to use the same solicitor and , of course, there are lots of charges. I wrote to the Manchester and they said they weren’t responsible for anything in Spain. I know this isn’t the same as the Icelandic bank but I feel that we were conned because of all the expenses. I complained to the solicitor but he wasn’t bothered. I am very interested in knowing more about this matter, as I did not know that this company was actually also lending in Spain. Was it a straight equity release, without the investment element, or was it on the contrary as other banks were doing, illegally? Would you be able to email me more information? i.e. marketing or promotional material, contracts etc.